After 78 hands of heads-up play with just a single all-in and call, MAIN EVENT III is all over after a shock end to proceedings. It came down to an all-in shove from Amjed Slewa (pictured below) over the top of Andrew Dales’ pre-flop raise to one million, with Dales making the call. It was Ac-5c for Dales against Ah-Qd for Slewa. The flop was dealt 2h-7h-4c, with the 7c on the turn giving Dales plenty of outs. The As wasn’t one of them as Slewa erupted from his seat and the celebrations were underway. Slewa ensures the MAIN EVENT trophy and bracelet is heading to Sydney for the third time, along with the $100,000 prize package that includes seats in the 2013 Aussie Millions Main Event and MAIN EVENT IV. Andrew Dales’ runner-up finish was the best for a South Australian in the MAIN EVENT, earning him a package of $65,000, which also includes seats in the 2013 Aussie Millions Main Event and MAIN EVENT IV. Slewa claims hands 134 and 135 while hand 136 starts with a bet from Dales for 800,000. Slewa calls and takes the pot when he announces all-in after the flop. Slewa remains in the chip lead with 8.1 million, while Dales is on 5.2 million. Hand 137 – another flop, which falls 3s-2c-Kd. The turn is 8s, river Qs and another pair of deuces sends the pot to Dales. Dales completes in hand 138, and the flop is all jacks! Turn is 3d, Dales bets 400,000 and Slewa folds. The board reads 10d-3c-Kh-Qc-Qd in hand 139 with no betting until Slewa makes it 750,000 and takes it down. It’s a walk for Dales in hand 128, and a walk for Slewa in hand 129 after Dales mucked in the big blind! They see a flop in hand 130, which is 2s-6c-4c. Slewa bets 450,000 and takes it down. There’s another cheap flop in hand 131, with a bet to 300,000 enough for Slewa. Hand 132 – Dales raises to 750,000 and Slewa calls. They see a flop of Jh-6h-Kh, Slewa checks, Dales check and the turn is 8h. Slewa checks, Dales bets 400,000, Slewa makes it 850,000, Dales is all-in and Slewa folds. Dales shows the 3d. The flop comes Jc-10h-2d in hand 133, turn 8s, river As with a pair of deuces good for Dales. The board is 8s-3s-6h-Ah-Kh in the battle for an unraised pot in hand 121. Dales announces all-in and Slewa folds. Slewa gets a freebie in hand 122, as does Dales in hand 123. Dales raises to 750,000 to kick-off hand 124 with Slewa making the call. They check down the board of 4s-2d-4h-10d-3c. Dales tables ace-high and scoops it up before getting a walk in hand 125. Dales then raises to 850,000 in hand 126 with a fold from Slewa. Dales gets to see a free flop in hand 127 and the board is spread 8s-Jd-Js-Kc-6h. Queen-high is good for Slewa. Slewa takes down hands 116 and 117 before the flop as both players look happy to wait it out and pick their spots. We see a flop in hand 118, which falls 3s-3c-8h – Dales bets 300,000, Slewa calls and the turn is Ad. Both players check and the river is the 7d. Dales checks, Slewa fires out 300,000, Dales pops it to one million and Slewa calls. Slewa shows J-8 and Dales sends his cards into the muck. No contest for Slewa in hand 119 and no contest for Dales in hand 120. And we’re back … with blinds up to 150,000/300,000, hand 111 goes to Andrew Dales after raising to 780,000 pre-flop. Slewa completes in hand 112 and the board runs out 3h-3d-8c-2h-7d. Slewa bets 650,000, Dales calls and takes it down with king-high. We see a walk for Slewa in hand 113, then a raise to 600,000 for Dales to take down hand 114. Dales raises to 650,000 and Slewa folds to make it three pots in a row. Hand 110 starts with Slewa completing and the players watch the board spread 8d-7h-6c-7d. Dales bets 700,000 and Slewa is reaching for chips. He calls and the river comes a dangerous 9d. Dales checks and Slewa bets three million. Dales folds. Players are given the option of a break, which Slewa is only too happy to accept. We’ll be back in about 15 minutes, with Slewa back in the lead (8.3 million to 5 million). We see another flop in hand 105, which falls 5h-5s-Qh, with a bet of 400,000 enough for Dales to take it down. In hand 106, Slewa raises 460,000 and Dales calls. The board is 7d-2h-9d, Slewa is all-in and Dales folds. The South Australian completes in hand 107 – the flop is Jd-10h-Qc, Dales bets one million and Slewa folds. Another flop in hand 108, and it falls 9d-3h-8h, turn 9c and Dales bets 250,000. Slewa calls and the river lands 9h. Dales bets 800,000, Slewa calls and Dales mucks without showing his cards. Slewa takes a walk in hand 109. Dales is now back in the chip lead (8.5 million to 4.8 million) but folds the all-in shove of Slewa pre-flop in hand 101. Slewa fills the blind on hand 102 and takes down the pot with a pair of jacks. Dales calls from the small blind in hand 103, Slewa checks and the flop falls Kh-8h-7d. Dales sniffs at the pot and takes it down. There’s another flop in hand 104 without any pre-flop action, and it comes Kd-4d-Jd. Dales bets 325,000 on the turn 5h and Slewa calls. The river is the Kh – Slewa bets 1.5 million and Dales folds. Dales raises to 600,000 from the small blind to kick-off hand 95 with a fold from Slewa. Dales folds after Slewa announces all-in to take hand 96, then gets a walk in hand 97. Action is with Amjed Slewa in hand 98 and he raises all-in. Dales folds and it’s another pot for Slewa, who now holds a 2:1 chip lead. Slewa gets yet another walk in hand 99. In hand 100, Slewa announces all-in, Dales calls and shows Kh-Js. Slewa has Ks-10s and misses the board of 6d-2s-8c-7c-8s to give Dales a pot worth more than four million. With blinds up to 120,000/240,000, Dales bets 600,000 and Slewa calls. The flop is 3d-6s-3c – Slewa checks, Dales bets 400,000, Slewa declares all-in and Dales folds to allow the Sydneysider to take the chip lead. We’re up to hand 92, with Slewa raising to 600,000 pre-flop and taking the pot. Slewa then gets a walk in hand 93. Slewa completes the blind in hand 94, Dales checks and the flop comes Qh-9c-6s. Slewa fires out 575,000 and Dales calls. The turn is the 4h, Dales checks and this time Slewa moves all-in. Dales mucks and Slewa looks unstoppable. Dales gets a walk in hand 88 then raises it to 620,000 in hand 89 to take another pot after Slewa folds. The dealer spreads a board of Ks-6s-8d-Ac-4h in hand 90, with Dales making a bet of 600,000. Slewa calls and both players show a pair of eights, but Slewa’s J plays and he takes down a nice pot. The stacks are now also even. Both players check down the board of Js-Ac-6c-6d-7s in hand 84. Dales bets 500,000, Slewa calls and Dales shows J-5 for two-pair. Slewa mucks, but gets a walk in hand 85. Slewa completes the small blind in hand 86 and the flop is spread 5s-Jd-3c. Dales checks, Slewa bets 600,000, Dales pops it to 1.2 million, Slewa shoves all-in and Dales folds. Slewa gets another walk in hand 87. Slewa claims hand 79, then completes the big blind in hand 80. Dales makes it 500,000 extra and Slewa folds. Another raise to 500,000 from Dales in hand 81, Slewa moves all-in and Dales folds taking chip counts back to where they started – Dales 9.4 million, Slewa 3.9 million. There’s a flop of Ks-Jc-6h in hand 82, and both players check the turn Kh. The river is 8s, Dales bets 650,000 and Slewa folds. It’s a walk for Slewa in hand 83. Another 500,000 pre-flop raise from Dales is enough to take hand 72, and the players see a flop of 9d-8d-9s in hand 73. Slewa bets 425,000 and Dales folds. Hand 74, and Dales again makes it 500,000 with a fold from Slewa. In hand 75, Slewa moves all-in and Dales folds. The South Aussie continues the theme of the final table with another bump to 500,000 and Slewa calls. The flop comes 5h-5d-Kc, Slewa checks, Dales bets 650,000 and Slewa folds to send the pot in hand 76 to Dales. Slewa is all-in from the small blind in hand 77 and Dales folds. Blinds are at 100,000/200,000 with no antes for the heads-up match with the button on Dales in hand 66, which the South Australian takes down. Slewa takes the blinds in hand 67, then Dales bets 500,000 pre-flop in hand 68 from the small blind. Slewa calls and they see a flop of Qc-Qh-5d. Slewa checks, Dales bets 500,000 and Slewa folds. In hand 69, Slewa shoves all-in from the small blind and Dales folds. Hand 70 starts with a pre-flop raise to 500,000 from Dales, Slewa is again all-in, Dales folds and Slewa claims a small victory. Players see a board of Ah-8d-9h-9d-Jd fall in hand 71, Dales checks, Slewa bets 725,000, Dales calls and Slewa shows 7h-10d for a straight. The heads-up combatants for the MAIN EVENT III title are taking a short break before the battle for the $100,000 first prize package commences. It’s South Australia’s Andrew Dales on 9.495 million leading Amjed Slewa from NSW on 3.855 million. The trophies, championship bracelet and thousands of dollars worth of chips have been placed on the feature table here in the Crown Poker room, and we’ll be underway soon. Déjà vu – Keast shoves over the top of Dales’ raise to 500,000 and he folds, handing the pot in hand 62 to Keast. Slewa gets a walk in hand 63, then shoves all-in to scoop up the blinds and antes in hand 64. The flop comes 2c-4c-2d in hand 65, with Keast announcing all-in and showing 3-4. Dales calls and tables pocket queens, which hold as the board runs out 7s, 6c. Daniel Keast is our third-place finisher, earning a packge worth $50,000 ($35,800 cash plus Aussie Millions Main Event package and MAIN EVENT IV entry). Dales gets a walk in hand 58, then raises for 500,000 from the small blind in hand 59. Keast announces all-in and Dales instantly folds. Keast raises to 400,000 from the small blind in hand 60 and Slewa folds. In hand 61, Slewa raises to 680,000 from the small blind and Dales pops it 1.5 million. Slewa goes into the tank and calls after a long deliberation. The flop falls 4d-Ad-Jd, Slewa checks and Dales bets one million. This is the biggest pot of the tournament so far and Slewa folds, handing he chip lead back to Dales. We’re down to three at the MAIN EVENT final table – Slewa completes the small blind in hand 56 and Dales checks. They check the board of 7h-Kc-2s-6h-7s, Slewa bets 225,000 and takes another pot. He was short stack when we returned from the break and is now chip leader! Blinds are now up to 100,000/200,000 with an ante of 20,000. Keast bets 300,000 onto the board of J-5-3-9 to take hand 57 from Slewa. A pre-flop raise to 355,000 from Dales is called by Ho in hand 52. They check the board of Jc-3c-4s-Jd-6c down. Dales shows A-9, which is good enough to take the pot. Michael Ho moves all-in from the small blind and Dales folds in hand 53 – he shows A-2 to gain a dose of revenge for the previous hand. In hand 54, Slewa makes it 400,000 and everyone gets out of the way. Ho makes a pre-flop raise to 450,000 in hand 55 and Slewa calls. The flop is Ah-9d-3c, and Slewa says he is all-in putting Ho to a decision for his tournament life. He calls and shows K-9 while Slewa has A-5, The board runs out 10s, 6d and Ho is out in fourth. Bredin kicks-off hand 51 with an all-in shove for 930,000 which sends Slewa into the tank. He calls. Bredin holds Q-2 and Slewa has A-5. The board is spread 9-A-3-4-10 sending Bredin to the rail in a gallant fifth place ($23,800 plus MAIN EVENT entry valued at $1200). Jono Bredin, now the short stack with just over 400,000 heading into hand 46, open-folds 5-2 from the small blind as Slewa scoops the blinds and antes. Bredin gets a split in hand 47 with Slewa after shoving all-in. Keast raises to 450,000 in hand 48 and takes the pot after showing pocket threes. Dales raises to 320,000 in the small blind and Keast folds in hand 49. It’s Slewa’s Kh-10 versus As-5c for Bredin in hand 50 with the Victorian at risk. The board is 9-7-8-8-9, doubling Bredin in timely fashion. Ho raises to 430,000 in hand 44 but there’s no love from the blinds and he takes the pot. Hand 45 – Slewa is again all-in (under the gun this time) with Bredin, in the big blind, asking for a count. Slewa’s stack is 1,080,000 and Bredin is left scratching his head. He calls, and finds his A-9 just behind the A-10 of Slewa. The board is K-A-10-2-3 handing Slewa a massive pot. Dales picks up where he left off with a pre-flop raise to 330,000 in hand 41 to take down the first pot of the second session of play. Action folds to Bredin on the button in hand 42, from where he moves all-in. No callers, and Bredin takes the blinds and antes. In hand 43, Slewa moves all-in from the button, Ho folds and Dales requests a count. It’s 470,000 and Dales makes the call. Slewa holds Q-J and Dales has K-8. The board is dealt 9-3-9-8-10 to give Slewa a straight and a timely double-up. Play is about to resume in the MAIN EVENT final table with the chip counts reading Andrew Dales 5,100,000, Daniel Keast 3,100,000, Michael Ho 2,650,000, Jonathan Bredin 1,300,000 and Amjed Slewa 820,000. The blinds will be at 80,000/160,000 with an ante of 20,000. We’ve hit hand 40, where Michael Ho raises to 240,000 to claim the blinds and antes. Players are now on their first 15-minute break of the day with five players remaining and Andrew Dales in the chip lead. Dales is off and running in hand 37 with a raise to 240,000. Keast again pops it to 600,000, Dales folds and Keast shows pocket 10s. Hand 38 commences with a pre-flop raising war that ends with Dales all-in. Ho folds and Dales takes down a nice pot. Keast and Dales see a flop of 6h-8d-Qh in hand 39 – Keast bets 600,000 and Dales calls. They check the turn 10d, Keast bets 600,000, Dales calls and they both show queens for trips but Dales’ 9 kicker plays and he claims a big pot. Bredin gets a walk in hand 35, then Ho raises to 250,000 to kick-off hand 36. Diakovasilis (pictured) declares all-in and the rail erupts! Slewa asks for a count, and the all-in is confirmed at 280,000. Slewa folds, Ho calls and shows Q-9 while Diakovasilis has K-Q and in good shape until the flop is dealt 10-9-10. The turn 4 and river 6 don’t help and Connie Diakovasilis is out in sixth – two spots better than husband Con in MAIN EVENT II – good for a package worth $20,000 ($18,800 cash plus MAIN EVENT entry valued at $1200). Slewa’s pre-flop raise is enough to take the blinds and antes in hand 32, as it is for Michael Ho in hand 33. In hand 34, Dales bets 240,000, Keast re-raises to 560,000 and Connie Diakovasilis has a long think before folding. Dales calls and it’s off to the flop of Kh-5h-3h. Keast checks as does Dales. The turn is 7d – Keast bets 600,000 and Dales calls! The river is Ad and it goes check-check. Keast shows pocket eights, Dales mucks and he takes down a pot worth at least two million. It’s hand 30, and Jono Bredin is all-in from the small blind but there’s no call from Slewa in the big blind. Connie Diakovasilis is all-in and receives calls from Slewa and Ho to start hand 31. The board is 5-10-4-7-7, Diakovasilis shows K-10 for top pair and takes the pot after Ho turns over 8-2 and Slewa A-4 to triple her stack. Keast raises to 250,000 in hand 30, Chilcott says he’s all-in and Keast calls. Chilcott shows pocket sixes but trails the pocket kings of Keast. The board runs out 5-Q-J-2-J and it’s down to a count with the stacks very even. Keast has Chilcott covered by a single 5000 chip and Chilcott is out in seventh spot ($13,800 cash plus MAIN EVENT entry valued at $1200). Dales is again in the action with a raise to 200,000. Keast moves all-in but Dales folds to hand Keast the pot in hand 27. The button is with Luke Simpson in hand 28 as Jono Bredin moves all-in under the gun. It’s back to Connie Diakovasilis and she folds to hand the last Victorian at the final table a nice pot. Hand 29, and Dales bets 240,000, Simpson is all-in and Dales calls. It’s pocket aces for Dales against Simpson’s pocket eights. The board shows 3-Q-4-J-6 and Simpson (pictured above) is our eighth-place finisher ($11,300 cash plus MAIN EVENT entry valued at $1200). David Chilcott is all-in from the cut-off for 1.2 million but gets no love as he claims the blinds and antes in hand 25. Michael Ho has the button in hand 26 and it goes to the blinds where Dales bets 260,000 from the small blind and Simpson calls. The flop is spread 9d-2c-6c. Dales leads out for 200,000, Simpson bets another 210,000, Dales declares all-in and the Novocastrian, who has led the tournament at various stages over the past two days, folds. We’re already up to hand 22 and Dales bets 210,000 from middle position to take down the blinds and antes. In hand 23, Ho raises to 260,000 under the gun to take down the pot. Jono Bredin makes it 205,000 in the cut-off to commence hand 24. Ho then pops it another 310,000 and it’s back with Bredin. He folds and Ho gains a measure of revenge after Bredin’s earlier shove. Dales raises it to 200,000 to take down the chips and antes in hand 20, then Ho makes it 260,000 to kick-off the action in hand 21. Jono Bredin announces that he is all-in for an additional 910,000. Ho stares down Bredin but he gives him nothing! Ho folds and Bredin is up 1.5 million. Simpson is in the small blind with short stack Trinh (pictured below) to his immediate left but chooses to give him a walk in hand 18. Action folds to Luke Simpson on the button in hand 19 and he bets 250,000. Trinh is all-in, Simpson calls and shows pocket aces. It’s A-6 for Trinh, but the board of K-K-10-J-7 brings no joy and he’s out in ninth ($8800 cash plus a MAIN EVENT entry valued at $1200). It’s a battle of the blinds in hand 16 between Ho and Dales – both check the flop of 10s-2d-5d, then Dales bets 150,000 on the 3d turn to take it down. Hand 17 starts with Trinh all-in for 150,000 with calls from Dales and Simpson. The flop falls Kd-8d-Jc, check-check, 7d, same again, 7d. Both Simpson and Trinh show sevens for trips, and it’s a chopped pot. Michael Keast bets 220,000 and shows pocket kings to scoop up the pot in hand 14. A bet of 300,000 from Trinh kicks-off hand 15, then Slewa slides his stack into the middle for an additional 300,000. Action is back to Trinh, who has only 450,000 with which to play. He calls, Slewa shows K-K, Trinh has J-10 and the board is dealt A-6-10-9-5 and Amjed Slewa doubles-up. Michael Ho makes it 180,000 to take the blinds and antes in hand 11. Amjed Slewa starts hand 12 with an all-in shove under the gun for 520,000, with Jono Bredin requesting a count. He folds and Slewa claims the pot. It’s lucky hand 13, with Ho taking it down after a raise to 180,000. Blinds are now up to 50,000/100,000 and an ante of 10,000 heading into hand 14. Hand eight marks Luke Simpson’s first pot of the final table after a pre-flop raise. Michael Ho raises to 205,000 to kick-off hand nine, with Trinh calling in the big blind. The flop is 5s-5h-7h, check-check, turn is 8c, Trinh bets 200,000, Ho folds and Trinh shows a 5 for flopped trips! Chilcott bets 180,000 pre-flop from middle position in hand 10 but gets no callers. It’s hand five, with a pre-flop raise to 110,000 enough for Diakovasilis to claim her second successive pot. Jono Bredin takes his first pot, claiming the blinds and antes in hand six. To kick-off hand seven, Daniel Keast raises to 200,000, Chilcott calls then Michael Geremia announces all-in and Chilcott calls. The flop falls 4d-8s-7s – Keast shoves for 590,000 and Chilcott is off to the tank but folds. Geremia shows Q-2, Keast pockets aces and takes the pot, eliminating Geremia (pictured) in 10th. Michael Ho makes it 250,000 from early position and there are no takers in hand three. Connie Diakovasilis is all-in on hand four for 250,000, Chilcott moves all-in and we’re off to the flop. Diakovasilis shows K-J, Chilcott has A-10 – the board runs out 10-J-6-6-2 to give Diakovasilis the pot. Hand two, and David Chilcott bumps it to 180,000 under the gun with Andrew Dales making the call. The flop is all nines – Chilcott bets 200,000 and Dales calls. The turn is Jh, check from Chilcott and Dales before the river 3c. Chilcott bets 380,000m Dales calls and shows pockets 10s for the pot. Chilcott showed A-Q. After the official welcome and a champagne toast, cards are in the air with the button in seat four (Sum Trinh). Blinds start at 40,000/80,000 with an ante of 5000 with Trevor ‘T-Bone’ Hyde working the mic. On the opening hand, Michael Ho raised to 85,000 to take down the first pot. It’s another typically diverse mix of players at the third edition of the MAIN EVENT final table. We have seven players from NSW, two from Victoria and one South Australian. Amazingly, Connie Diakovasilis has emulated the feat of her husband Con, who finished eighth in MAIN EVENT II. Connie is also out to surpass the finish of Marion Fisher in MAIN EVENT I and become the first female champion in this tournament. The popular support will be with Mornington Peninsula player Jonathan ‘Jono’ Bredin – with the help of a couple of friends handling the hole card and betting duties, the 22-year-old wheelchair-bound poker fanatic is fourth in chips and already assured a nice payday. 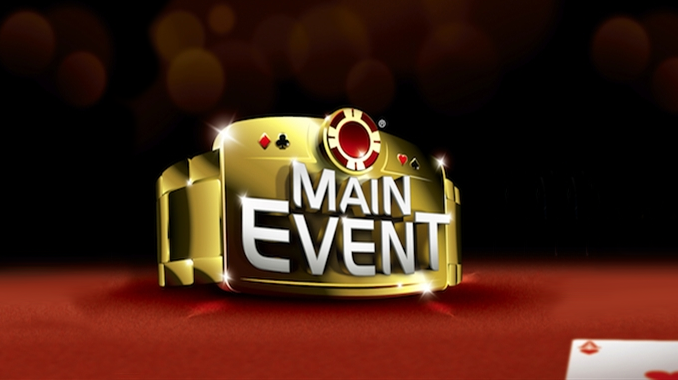 All eyes will also be on the first prize package of $100,000, including Aussie Millions Main Event and MAIN EVENT IV seats and a stunning $5000 championship bracelet (pictured above). It’s another sensational Melbourne day with the Crown Entertainment Complex heaving under the weight of the weekend crowd. Railbirds are also starting to arrive to ensure prime position for today’s MAIN EVENT III final table, which is due to start at 2pm today (Sunday).